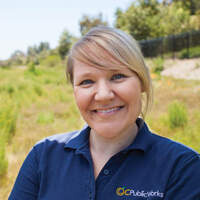 Ms. Voss is the South Orange County Watershed Manager at OC Watersheds, a water quality compliance agency that is part of the Orange County Public Works Department. The department coordinates watershed planning efforts, collects water quality, hydrologic, and meteorological data, develops large-scale water quality projects, reduces pollutants in local waterbodies, and ensures countywide compliance with state and federal water quality regulations. Student Q&A about environmental and sustainability careers will follow. Sponsored by the USC Wrigley Institute for Environmental Studies, the USC Center for Sustainability Solutions, and the USC Environmental Studies Program.